He held the fate of two worlds in his hands... Once he was an orphan called Pug, apprenticed to a sorcerer of the enchanted land of Midkemia.. Then he was captured and enslaved by the Tsurani, a strange, warlike race of invaders from another world.There, in the exotic Empire of Kelewan, he earned a new name--Milamber. He learned to tame the unnimagined powers that lay withing him. And he took his place in an ancient struggle against an evil Enemy older than time itself. 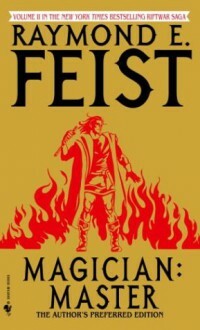 Finished my re-read of Magician and it was as good as I remembered.